"These are probably close to my best chicken wings yet; everyone that had them loves them!" Preheat smoker to 200 degrees F (95 degrees C) and add 1 cup wood chips to start the smoke rolling. Liberally coat chicken wings with about 2 tablespoons Cajun seasoning. 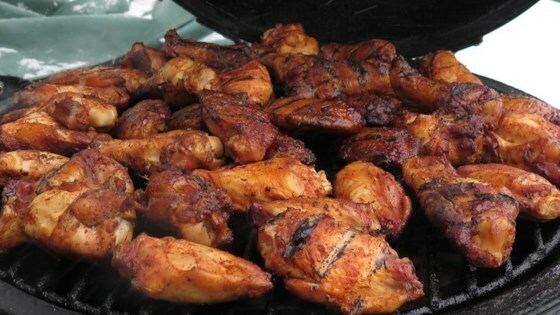 Place wings directly on the grate in the smoker or in an aluminum pan with holes to allow airflow. Add more wood chips as needed to continue smoke. Smoke wings for 2 hours. Combine butter, garlic, and 2 tablespoons Cajun seasoning in a large saucepan over medium-low heat; cook and stir until butter is melted, about 1 minute. Stir hot sauce into butter mixture; simmer, stirring occasionally, until sauce has thickened, about 30 minutes. Preheat grill to 375 degrees F (190 degrees C). Cook wings, 10 to 12 at a time, in the deep fryer until no wings are longer pink in the center and are lightly browned on the outside, 5 to 7 minutes. Remove wings from the oil with a slotted spoon, letting excess oil drain from the wings. Place cooked wings on a baking sheet and liberally coat each wing with hot sauce mixture. Place coated wings directly onto the grates of the preheated grill; cook until sauce has caramelized and wings are crisp, 2 to 3 minutes per side. Great wing recipe! I've cooked wings a lot of different ways, but this was the best I think. They were a hit (although the kitchen was a mess!). Way too much work. Smoke then fry then grill. This recipe is awesome! We use Old Bay seasoning and skip the deep frying. We go from the smoker, dip the wings in the sauce and straight to the grill.